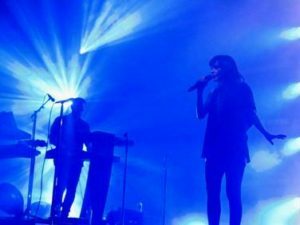 The success of CHVRCHES is proof that there is still an international market for synthpop. Successfully overcoming the second album syndrome that afflicted LITTLE BOOTS, LA ROUX, LADYHAWKE and HURTS, ‘Every Open Eye’ showcased a refined CHVRCHES and their knack for great songwriting. 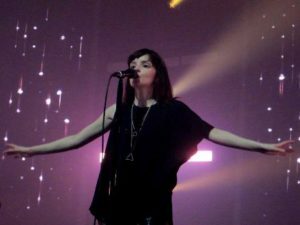 Now elevated to arena status, the gigs at the SSE Hydro in their hometown of Glasgow and tonight at London’s Royal Albert Hall are evidence of how far CHVRCHES have come. It’s been an upward trajectory for Lauren Mayberry, Martin Doherty and Iain Cook since their debut album ‘The Bones Of What You Believe’ in 2013. As well as selling half a million copies worldwide, TAYLOR SWIFT notably borrowed their sound for her song ‘Out Of The Woods’. However, the success had taken its toll on the group’s frontwoman, with online misogynistic attacks and criticisms of her static stage presence. This has been tough on her psyche but thinking positively, a change in approach has successfully allowed her to differentiate between her public and private personas. This attitude is reflected in Mayberry’s new found confidence on stage, while she still retains her charming, down-to-earth banter with the audience in the manner of a student who still can’t quite believe she has the best job in the world. Appropriately, the opening ‘Never Ending Circles’ is her fight back manifesto. Known for practically standing still at CHVRCHES earlier shows, tonight she is back and forth, punching the air with aplomb, as the following ‘We Sink’ from ‘The Bones Of What You Believe’ reinforces the mood. 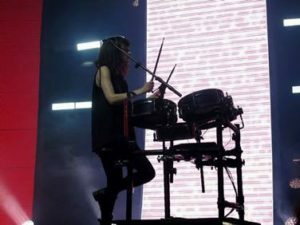 Aided by three screens displaying everything from pixelated images themed around the ‘Every Open Eye’ artwork, to the bars and triangles last seen on GARY NUMAN’s ‘The Touring Principle’ shows, CHVRCHES have indeed developed as a live act. The presence of frantic new numbers like ‘Keep You On My Side’, ‘Make Them Gold’ and ‘Empty Threat’ reflect the influence of their American success. Riding on the natural momentum of those songs, Mayberry and Doherty swap positions for the live debut of ‘High Enough To Carry You Over’. A big improvement on ‘Under The Tide’ and ‘You Caught The Light’ from their debut, it’s a credit to Doherty for taking singing lessons and delivering a fine slice of Trans-Atlantic pop. The punchy ‘Playing Dead’ keeps things lively before the brilliantly hypnotic power of ‘Science/Visions’, complimented by a mad display of lighting. A sprightly ‘Gun’ continues the first album innocence until Mayberry drops to the floor. Remaining there for the first verse of ‘Bury It’ , this is a slice of feisty machine pop that will become a girl anthem of the future. Doherty makes his return to the mic for the polarising ‘Under The Tide’; the CHVRCHES faithful lap it up, but the casuals sitting further back in the huge confines of the Royal Albert Hall take the opportunity for a comfort break. With his one-legged kick dancing, what can’t be denied though is The Dok’s enthusiasm and sense of fun. The sweet but solemn ‘Recover’ acts as a breather, before the momentum of the home stretch is raised with ‘Leave A Trace’ . A magnificent ‘Clearest Blue’ closes the main set, wonderfully held in a state of tension before the potent lift in the final third which sends the Royal Albert Hall crowd into a total frenzy. 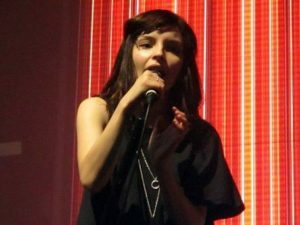 For the encore, ‘Afterglow’ with its angelic ambience sees Mayberry exposed and practically acapella; it is a beautiful moment which adds a new string to CHVRCHES’ bow. Finishing with ‘The Mother We Share’ , this song of such quality that it really could be covered by TAYLOR SWIFT and sell millions! Tonight, CHVRCHES are at the height of their powers and even feel able to leave out their calling card ‘Lies’. Two albums on and several world tours later, CHVRCHES have proved themselves as the saviours of synthpop. What this Glaswegian trio have managed to do is get youngsters listening to electronic music outside of the brainless EDM complex. 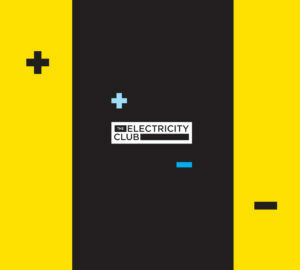 As far as synthpop is concerned, this can only be a good thing for the future of the genre.